We've now lived in Singapore for more than a month and seriously owe a post on what we've been eating the past few weeks...which to sum up, is about everything. It may be a little unfair to say that I came to Singapore with fairly high expectations of the food here, and I don't take blame for this since food is always the first thing you hear about Singapore. But I'm very happy to say that those high expectations have been met so far. I've noticed that this is truly a city full of food lovers who don't come remotely close to being foodies. Good food is just part of everyday life and this has nothing to do with being hip. I find this so refreshing compared to the long queues at London's weekly top no-reservations restaurants. Perhaps this has something to do with the natural forces of supply and demand (or more likely I've spent too much time studying for my prices and markets class), there are seriously SO MANY places to EAT. -real hawker centers: mainly outdoors, no A/C, full of locals, usually quality food. Some notable ones visited so far are: old airport road, tiong bahru, chinatown food center, maxwell, changi village, alexander village. -regular food courts: in malls and shopping centers, has A/C, a little cleaner seating, but not as authentic. -local restaurants: sometimes it's even a little hard to distinguish between a restaurant or a hawker center as many restaurants are outdoors with very casual seating. The food is more expensive (obviously) but still cheap, and we've visited many good ones so far. Also, pro of many restaurants is they usually have "beer ladies". In many western countries this might be a young perky 20 year old girl in a skimpy outfit pouring shots down your throat. Here, she's just a regular Asian woman who goes around and refills your tiger beer. She could be my mom. For ease, I'll sort this post in terms of dishes and start with the famous chili crab. We've had this twice, once at No Signboard in Geylang and again at Jumbo Seafood in Dempsey Hill. Despite the name, chili crab isn't really THAT spicy, it's actually quite sweet. The generous sauce has some small bits of crab in it, and can be sopped up with little buns or even some white rice. There is an alternative black pepper crab we tried at Jumbo Seafood which I really loved too. The black pepper crab is served dry without sauce. It's for serious black pepper lovers though, so don't try it if you just like a little salt and pepper with your dinner and that's it. Try it if you want to bathe in smokey black pepper with a glass of scotch. By far that best thing that I have eaten so far is this little roll of heaven called popiah at Old Airport Road Hawker Center. Popiah is one of those things that nobody told me about and nobody talks about. This bothers me a little because it's so damn good! Since having it at Old Airport Road, I've tried it two more times at Tiong Bahru and Maxwell and neither even came close. This demonstrates that there is truly a difference between the thousands of hawker stalls. 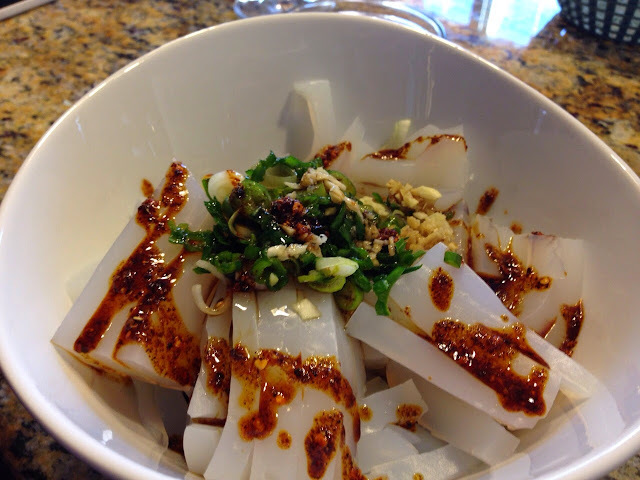 Popiah is a little rice wrapper that can be filled with a combination of peanuts, cucumbers, spring onions, stewed radish or turnip, dried shrimps, egg, chili, etc. It's salty, spicy, crunchy and refreshing. Basically, it's perfection, as long as you get it from Old Airport Road. Another favorite so far has been the satay skewers. Since my diet here consists of mainly veg and rice, it's nice to tuck into some grilled meat, especially when dipped in the addictive satay sauce. The meat is kind of sweet and smokey and the skewers are so small you could eat like a hundred. Food challenge idea? I've tried satay at numerous places including Old Airport Road, Satay Street, Changi Village and even at a student BBQ. To be honest, they were all equally good, I really could not tell the difference. Satay Street is quite famous because all the stalls serve it and it's a lively atmosphere. They also have whole peel and eat prawns, win. 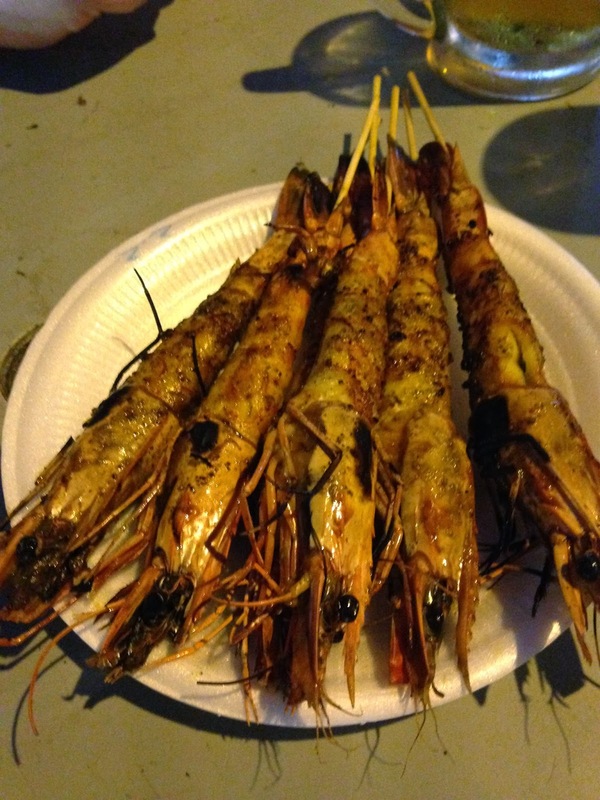 The ones pictured below are from Changi Village and Satay Street. During one of our first nights, we went to a local hawker center in Geylang and did one of those pick something that looks good on picture without really knowing what it is. I thought this would be a stir fried noodle dish, it turned out to be Nasi Goreng, which is Indonesian fried rice. And it's also amazing. This one pictured below is from Changi Village. Of course you can't really talk about food in Singapore without mentioning chicken rice. This was actually the first real meal I had here at a lunch at Maxwell Food Center. I really liked this for its simplicity. This is a stark contrast to to Nasi Goreng and many other local dishes. The flavor is clean, the chicken is tender since it's cooked whole. Also, it is relatively healthy, which is always plus for a country where almost every meal is eaten out. Speaking of healthy, everywhere I go I crave something green in an attempt to keep my diet balanced. The good thing about Asia is there there are so many vegetables choose from and they are all really good. Apart from the usual stringbeans and and broccoli (though I do love both), I enjoy the variety of greens. I only wonder if it's still considered healthy when sauteed in sambal sauce.... Anyways, pictured below is the sambal kangkong at No Signboard. I want to go on with the rest of my good eats, but the list is endless, and the pictures just keep reminding me of how much I should blog more. Maybe someday when this is my full time post-MBA job... HAH! I dream. 34 days in Singapore and it's been a wonderful and filling journey. Next time, more about some of the restaurants AND travels, which are coming up!